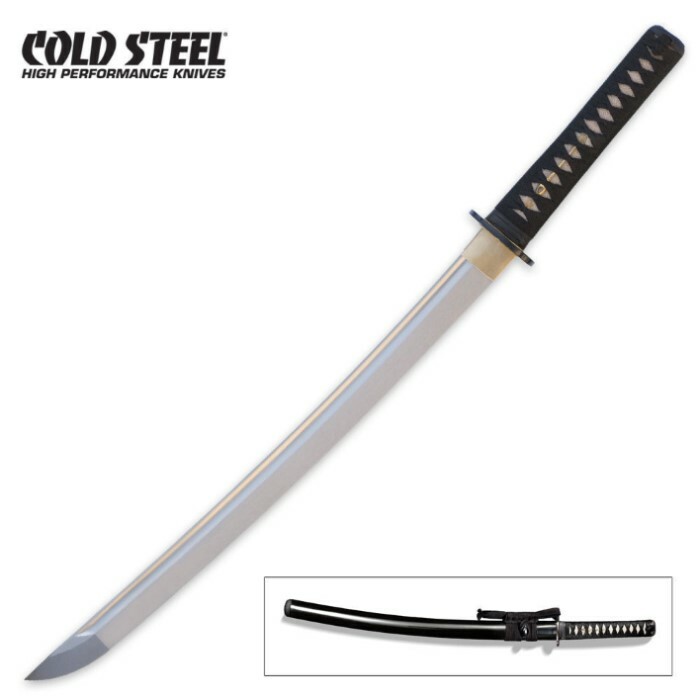 Cold Steel Warrior Wakizashi Sword | BUDK.com - Knives & Swords At The Lowest Prices! The wakizashi was a Japanese short sword worn along with the katana. It served as a companion sword for the samurai, and could be used in the off-hand when engaged in battle. The wakizashi was often used to take the heads of defeated enemies and thereby prevent additional wear on the katana blade. This battle ready item measures 29 1/2" overall in length and features a 21" blade of 1055 carbon steel. It is elegantly adorned with a ray skin wrapped handle that offers a black braid cord wrap and brass menuki. This wakizashi includes a black lacquered wood sheath and blue violet cover bag. This is a top quality item you will be proud to own! Cold Steel, 88BWW.